University of engineering and technology UET Lahore main campus and other UET Campuses starts taking admission applications for undergraduate programs, the students who give the ECAT entry test on date 15 July 2018 are eligible to apply for undergraduate engineering programs for session 2018. Last Date for Submission of Admission Application: Monday, 24th September 2018 up to 4:00 pm. Applications are invited from the prospective candidates for admission in undergraduate programs at U.E.T. Lahore and its campuses. Only Punjab domiciled applicants are eligible to apply. Receipt of applications shall start from Monday, 10th September 2018. Applicants who appeared in the Combined Entry Test 2018 conducted by UET, Lahore on Sunday, 15-07-2018 are only eligible to apply. Applicants should have at least 60% marks in F.Sc. / B.Sc. / DAE or B.Tech (Pass) as well as 50% aggregate marks. Candidates applying on the basis of B.Sc must also have at least 60% marks in F.Sc. 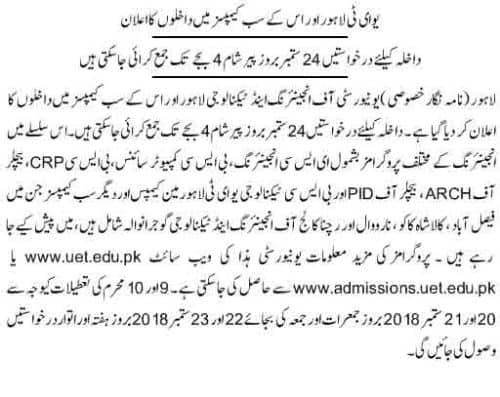 On-line application filling facility would be available from the UET admission portal http://admission.uet.edu.pk from 12:00 mid night of 10th September 2018. Prospective applicants are advised to follow the steps described in the University Undergraduate Prospectus 2018 for filling of admission application. 2. The printout of filled application along with the documents as detailed in the prospectus shall be submitted at the designated locations within University of Engineering and Technology, Lahore on working days Monday to Friday from 8:30 a.m. to 3:30 p.m. (with break from 12:30 pm to 1:30 pm and on Friday break from 12:30 pm to 2:30 pm). Submissions by post or courier are NOT acceptable. 3. Any request to increase F.Sc. marks, updated by BISE after rechecking of intermediate papers, will not be accepted after last date of submission of admission application that is 24-09-2018.